Even though love and desire are basic aspects of the human experience, somehow we can define our political stances in unambiguous terms while the subjects of our affection and romantic feelings remain mercurial and amorphous and difficult to express in cold, hard facts. On some days, it’s easier to argue with a GOP granddad over the existence of global warming than to face that someone across the room and tell them just what magnetic force draws you near. And What good is rock and roll without a love story, right? In the realm of Rose Ette – an indie rock/dream-pop band from modern-day Houston (but spiritually Olympia or London from two or three decades back, respectively) – the emotional hurdles that can obstruct both interested parties from honest and true bonds are real struggles worth fighting for. With Rose Ette’s debut album, Ignore The Feeling (out January 25th via Miss Champagne Records), four romantics (that would be band leader and singer/guitarist/keyboardist Teresa Vicinanza who is joined by Daniela Hernandez on vocals and lead guitar, Jessica Baldauf on bass, and drummer John Baldwin) capture those challenges in a bell jar; even manic obsessions and unwanted stalkers shine with the opal sonic glow of bands like Lush, or Camera Obscura, or any of your favorite C86 tapes from your lost (or invented) youth. Three years ago, the band’s first EP, Jungle, featured the unpolished diamond of “AH AH”, a shredded telegraph from a much murkier garage band (and, admittedly, a completely different crew). That tempered snarl still comes out on “Awake”, the first single and a hefty slice of Speedy Ortiz-sized fuzz to remind everyone that the battle’s not yet over. The LP engages from the start with the charming “All The Way” that peaks with Teresa’s airy tone, but also stays grounded with angular guitars, a rubbery bass line, and a kicky beat. A sharper, scrambling guitar line fries the second half of the track with discordant energy. Mournful organ tones and regretful vocals underpin “Never Gonna Get It”, but the beat is up and an added layer of synth notes keep the music bright. Album-ender “Predator” shines with longing, aerial harmonies, delicate guitar reverberations, and a steady beat. Like a heart possessed by either passion or conflict (or both at once), the songs don’t stand still for a second, but are in flux, always searching, questioning, yearning, and hoping for the mysteries of love to reveal themselves. Back in August, Rose Ette picked up a limited run of Ignore the Feeling LPs before their day-show at Athens Popfest. Right after their blissful set at Little Kings Shuffle Club, folks piled up at the merch table for a copy, and the line backed up to the patio. 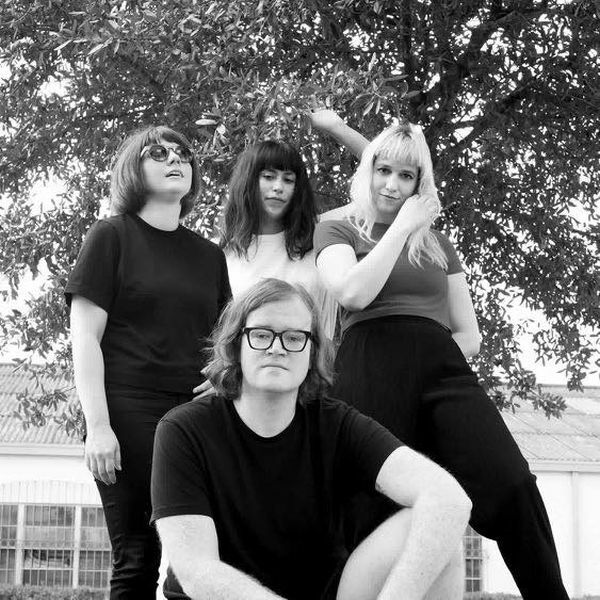 The alluring band has enchanted many a crowd in the past three years, jumping on bills with Deerhoof, Fred Thomas, Dressy Bessy, and La Luz, to name a few. Teresa and Daniela graciously took the time to delve into each track off Ignore the Feeling, giving listeners some meaningful insight into their music. “Skin” is the first song we worked on together as a band and it came together very naturally. It’s a song about romanticizing a feeling; the feeling that you know someone beyond the surface, at first sight, before you have even met them. “All the Way” was lyrically inspired by a Sylvia Plath quote “I sometimes think my vision of the sea is the clearest thing I own,” I’ve always interpreted that line to mean that that the most certain thing we can ever know, is that we will never know anything for certain. It’s a song about not knowing anything that the future may hold but trying to ride the ups and downs (waves) with ease. “Ignore the Feeling” musically, turned out as a bit of a meditative track. It’s about feeling like your in a purgatory after a trauma, where you can’t ignore or let go of the past. It’s simultaneously a question about whether you even want to let go? The song is meant to build to Daniela’s fuzzed out, yearning, guitar line at the end. “Awake” is a personal reflection of time spent obsessing over a situation. but realizing that your brain is almost tired of thinking about it. It is meant to be a bit darker in tone than some of the other songs on the record. Jessica’s brooding bass line carries the song from beginning to end. “So Close” is kind of an extension of “Awake“… it’s another song about obsessions and feeling manic. It explores the feeling of dichotomy between being close to, but far away from a specific thing you are trying to work toward. “Mask” is a song about exposing a dark secret of someone you are close with, and the feeling that no matter how reassuring they are, trust is difficult to build back and doubt still lingers. The song was written as a way to work out resentment and feelings of apathy in the midst of the holiday season, and starts with a fuzzed out guitar lead that reprises before the final chorus, where repeating lyrics reassure the subject that there’s no longer a disguise they can keep. “Mirrors” describes an estranged relationship. The lyrics create the imagery of two people trapped in a funhouse of mirrors, with different reflections and projections skewing perspectives. The anxiety of being misunderstood eventually fades, when in the bridge the lyrics describe the relief of realizing that it’s not worth losing sleep over. “Never Gonna Get It” was the last song written for the album. Lyrically and vocally, a collaboration between us [i.e., Teresa and Daniela], the song outlines attempts to bury and ignore feelings of frustration that creep up. The song works through that frustration and resolves that, in some situations, you just have to keep your guard up.